As an Absence Management Software company, we know that it is essential for companies to monitor employee attendance. Not only does it allow you to uncover the true cost of absence, but it will also let you uncover any potential underlying issues in the business - such as staff morale and productivity. But there is another factor at play, one that is much harder to identify and monitor, but one that could be equally as costly to the business: Presenteeism. In 2015 Cary Cooper, Professor of Organizational Psychology & Health at Manchester University, described presenteeism as ‘the biggest threat to UK workplace productivity’. Alarming stuff. But what is presenteeism and how can you combat it? What is presenteeism and how has it come about? Presenteeism comes in two forms. First, where employees come into the office when they really shouldn’t be there (due to illness, for example) and second, where workers come in early or stay late regardless of their workload, therefore working way over their contracted hours each week. This culture has developed due to a number of factors. The digital transformation of the workplace, instant communications, workplace pressures and norms, operational demands, reduced job security, workplace perceptions, competitive job markets and the economic downturn have all played a part. But how does presenteeism affect your business? The first, and most important thing is productivity. If workers are regularly coming into work ill, this is bound to have an effect on how productive they are. Whilst people coming into work when sick may seem infrequent and may be perceived as a sign of dedication and something to be admired, it's actually something that is far more prevalent: in 2015 the CIPD reported that nearly one-third of staff persistently turn up to work ill.
On the other side of things if employees are working far over their allotted hours it could quickly lead to burnout and of course a loss of productivity. Furthermore, associated physical and mental health issues, stress levels, employee errors and increased staff turnover can all result from presenteeism and ultimately impact your business. One of the main issues is identifying presenteeism. With absence, you can see when someone is off work and you are able to monitor the situation. However, how can you tell how many hours people actually work without being there all the time, or whether employees are playing down any illness? These issues will always exist but there are ways you can reduce the effects of presenteeism. Culture can be an important factor when it comes to presenteeism. If your company has a pressurised culture, or where people are concerned about their job security, then presenteeism will not only exist but will be inadvertently encouraged. You need to develop a culture where your employees feel trusted that they can take a day off when feeling unwell. Communication is also key. If a member of staff does not feel they can approach you, or their line manager, about a potential issue it is most likely the issue will remain under wraps and may have a negative effect. Employers can utilise informal communications, or more formal settings such as employee satisfaction surveys or regular performance reviews, to ensure communication is encouraged. 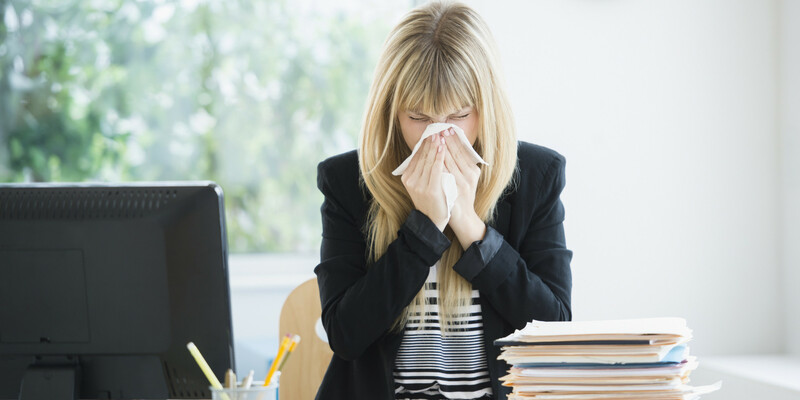 Does your absence management policy effectively discourage employees for taking sickness leave? An example may be withholding pay for those who are off sick above a certain number of days, or potential disciplinary action. If so, this will no doubt lead to presenteeism as people will come into work to avoid being penalised. You need to ensure there is flexibility within your policy, and that any managers are trained and fully aware of it. Return to work procedures can also help here when it comes to longer term absences. A recent study from Ricoh showed that 41% of employees said they felt bosses favoured those who worked beyond their contracted hours. With this sort of perception it's no wonder that some people are staying way beyond to curry favour. But instead of rewarding on the hours spent in the office you need to create a culture where output and deliverables are rewarded, not the input time. That way people will come to see that spending every hour in the office is not effective and presenteeism can be reduced. As a manager or a business owner you are always going to be busy and it’s easy to lose sight of your employees' individual workloads, their workplace motivation and general workplace wellbeing. But you need to keep an eye on the situation. There may come a point when one or two individuals are overstretched and this may lead to a period of presenteeism and ultimately absenteeism as they experience burnout and potential illness. This could be done through regular informal chats or even through the regular scheduling of 1-2-1s. By keeping an eye on your employees’ workloads and any subtle changes in motivation/personality you can tackle any issues before they become a problem. So just like absence, presenteeism can have a detrimental effect on your business but with the above plans and policies in place you can help reduce and tackle the issue, avoiding the cost to your business and your staff.